Remember Janice Litman Goralnik? The famous on-again-off-again girlfriend of Chandler Bing? If you don’t, let’s jog your memory, shall we? 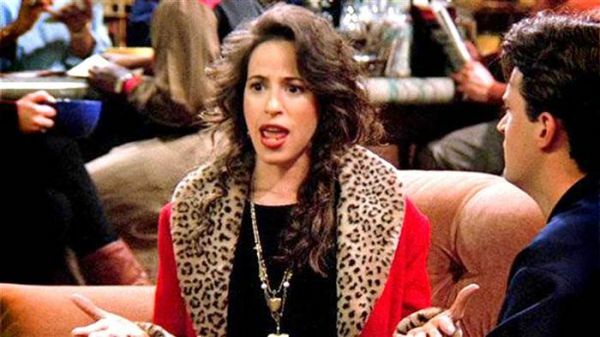 The big-haired, loud character from Friends was best known for a hilarious combination of a mind-numbingly nasal voice and her catch-phrase, ‘Oh, my God!’. But has anyone ever noticed how outrageous, yet impressive her outfits were? No, I’m not talking about Rachel. Even though Rachel’s wardrobe will always be up there on our list, it’s time Janice finally got some credit for her OTT style choices. Scroll on to see how she slayed throughout the show! Gotta love the girl for knowing how to do monochrome like a pro. For someone with a loud personality, she pulled off this sophisticated outfit effortlessly. Let’s not forget the pearl medallion necklace and that animal print handbag she took everywhere! Let’s face it, Janice knew how to dress for a party. I mean, c’mon, her boyfriend might be thinking of ways to dump her at the time… but her outfits never faltered! Exhibit A, she’s got on the cutest polka dotted tutu skirt here. She’s wrapped a baby pink satin belt around her waist for a visual break from all the black. Who would’ve thought? P.S. extra points for that simple pearl choker. It’s like this coat was made for her, isn’t it? The red. The leopard print collar. It all screams ‘Janice’. Something we could see on international runways still, this coat seems to work its magic on her in this particular episode. Remember her speech when Chandler tries to break up with her? “You need me. You can't live without me. And you know it. You just don't know you know it." Self-confidence level: 100. As if her personality wasn’t extra enough on Friends, amirite? I’m serious though, this look was one of my favourites from the show. It could be because I’m a fast-talking, ‘oh, my god’ shrieking drama queen IRL and quite an ‘extra’ dresser, myself. Let’s break it down, the Chanel outfit and the rhinestone studded buckle on that chunky belt = love. Also, love her Chanel earrings and how she’s stacked all the bling on her throat. Coco would be shocked, but she did us proud! It looks easy, but going co-ord is a bold fashion choice. Especially, when it’s monster green! Given that Janice (obviously) was never afraid to be herself, it seems to have come naturally to this woman. The mini peplum double-breasted coat and matching pants look fantastic on her. Yay for Janice! If only I had this funky psychedelic print in my closet. This look is proof of the fact that the woman could work all kinds of outfits with ease. I’m also digging the chunky lime green earrings Janice pairs here, with her 70s style shirt and hair. Dropping your boyfriend off at the airport for his fake flight to Yemen calls for a standout look, yes it does. At least Janice seemed to think so. I’m not complaining because I think her velvet on velvet outfit is brilliant. Also, I’m not kidding, her embroidered leopard print bag is on my wishlist. Hit me up if you find it, ‘kay? And.. Janice passes with flying colours! 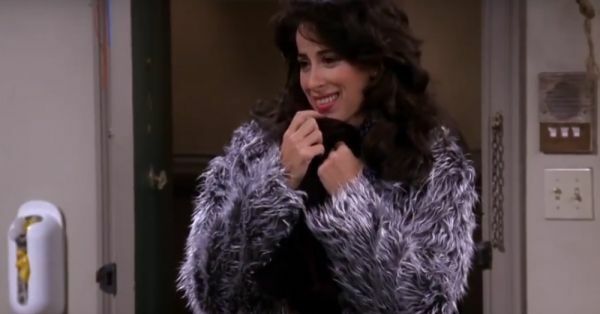 Isn’t this faux fur coat Janice has on super chic? The perfect to surprise your casual lover’s friends in? I’m not joking though. Yep, this is the unforgettable moment when and everyone finds out who Ross casually hooked up with (and heavily judge him for it). Feel like binge-watching F.R.I.E.N.D.S. AGAIN? Tune in to Comedy Central for the FRIENDS Ultra-Marathon, 19th Jan - 23rd Jan, Now Playing! Watch all the 10 seasons, in 5 days airing back to back only on Comedy Central, and participate in the "India’s Biggest Fan of F.R.I.E.N.D.S” contest.